For all the BHS Black Friday deals you have landed on the right page. British Home Stores is located all over the UK with over 170 stores selling products such as electronics, furniture, clothing, gifts, entertainment and more such as fragrance, toys, wedding etc. 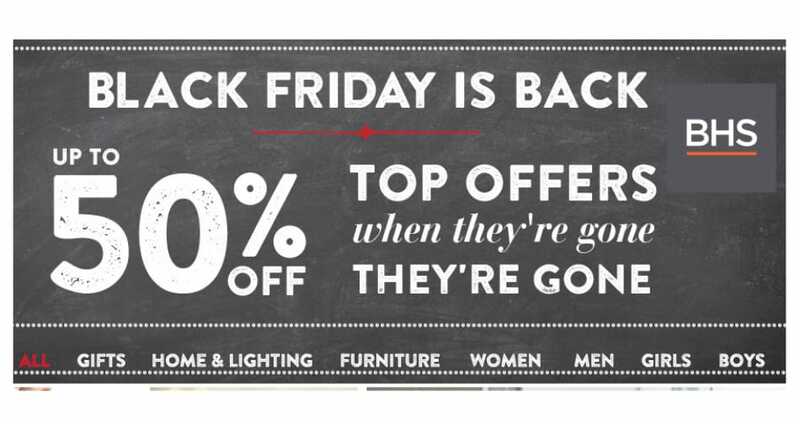 Catering for men, women and children you do not want to miss out on the BHS Black Friday sale. There will be many BHS discounts right up to 50% off selected items; you have to be quick when such deals go live because once they have gone they’re gone. So if you are after boys, girls, men’s, women’s, furniture, home & lighting, gifts or anything else be sure to be on this page in November each year. Even though this is a Black Friday page please be aware we will list other deals as and when they pop up. BHS Black Friday deals will be coming soon, in the meantime please join BFUK on both Facebook and Twitter for all the latest updates. The BHS Black Friday hub will have plenty of deals when they are live again, be sure to check here on a regular basis. The BHS Black Friday sale is official – It starts Monday 21st November 2016 until Sunday 27th. If BHS has been purchased by a new investor does this mean we can expect a new BHS overhaul and some black friday deals? The BHS website is now closed, apparently it will open in the autumn, but will it? Get up to 50% off BHS gift clearance, as well as up to 20% off alcohol gifts, home winter wonderland and home nostalgic noel products. You can also get up to 50% off the BHS Home Event as well as many other deals on kids and gifts for him and her etc. Keep looking for many bargains. I could do with another handbag, so if they are offering 50% off i am happy with that, thanks. Is it only going to be for one day BHS is doing Black Friday? Be good to see them doing for the whole weekend. Get half price or less on women’s tops, lighting, women’s shoes, men’s casual shirts, girls dresses and more. I see they are selling the £80 Luxury Festive Wicker Hamper for only £40, but will this price be reduced even further come the Black Friday sales? Your not wrong Craig, my wife just purchased the Ursula Crystal Ball small pendant light which was £200 for only £80. I would normally moan when she spends but this was a true bargain. At the moment there is the BHS Lighting Event where you can save up to 50% on marked prices. I remember last year i purchased online the Indulgent Hamper via BHS for only £50, the original price was £100.